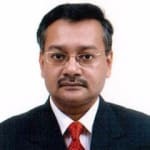 Dr. Amit Kumar Mandal completed his MBBS in 1993 from Maulana Azad Medical College and Diploma in Tuberculosis & Chest Diseases from Vallabh Bhai Patel Chest Institute, Delhi. He did his DNB in Respiratory Diseases from Lala Ram Swarup Institute of TB & Respiratory Diseases, New Delhi. Previous experience: Senior Consultant Pulmonology & Incharge Department of Medical Intensive Care Pulmonology, Fortis Hospital (NABH & JCI accredited hospital), Mohali, Punjab, India. Guide for IDCCM (Indian Diploma in Critical Care Medicine) wef 2010. Consultant since April 2006 till 31st July 2008 Department of Pulmonology Thoracic Surgery & Medical Intensive Care Unit. Fortis Flt Lt Rajan Dhall Hospital,B1, Aruna Asaf Ali Marg, Vasant Kunj, New Delhi 110070, India. Escorts Heart & Research Institute, Okhla, New Delhi, India. Junior Consultant since 2002 Jan till March 2006 Chest Physician & In-Charge of ICU. Mata Chanan Devi Hospital, Janakpuri, New Delhi 110058, India. Senior Resident and DNB fellow (Respiratory Diseases) since 1997 till Jan 2002. Medical Education, Certifications and fellowships/Research Papers: Mar 2007: Interventional Bronchoscopy, Medical Thoracoscopy and Thoracic Ultrasonography for Pulmonologists at Lahey Clinic, Burlington, Massachusetts, Boston, USA Mar 2008: Sleep Medicine & Sleep Diagnostics at Kuala Lumpur, Malaysia. Aug 2009: USCLS (Ultrasound Critical Life Support) Basic Level  1 Provider by Prof. Luca Neri, EHIRC, New Delhi, India. Mar 2011: Hemodynamic Monitoring, ISICEM, Brussels, Belgium. Save your time and book an appointment online with Dr. Amit Kumar Mandal on Lybrate.com. Find numerous Ophthalmologists in India from the comfort of your home on Lybrate.com. You will find Ophthalmologists with more than 25 years of experience on Lybrate.com. View the profile of medical specialists and their reviews from other patients to make an informed decision. Hi doctor, I am actually going for army and suddenly my eye number has became 3 on each side I do not know what to do? I have invested my whole money in army and do not have money for lasik can you please suggest me a eyedrop and others for 20 20 vision. If you expect to improve it by a simple eye drops then it is not possible. You will need to take proper treatment. Till then start a multivitamin tablet. My numbers in my eyes are -5.50 and -5.75. So what should I do to maintain my eyes. Is this condition really serious? Hello, follow the below tips to strengthen your eye muscles. Exercises for eyes: Warm your eyes. Rub your palms together to create heat, and then place them against your eyes for five seconds. Repeat this three times. Roll your eyes. Start by looking up and then slowly circle 10 times clockwise and 10 times counterclockwise. Focus. Hold a pen at arm's length, focus your eyes on it, and slowly bring the pen closer until it's about 6 inches away from your nose. Then slowly move it back, keeping your eyes focused on the pen, 10 times in all. Massage your temples. Using your thumb knuckles, massage your temples in small circles, 20 times in one direction and 20 in the other. Repeat the same actions above the mid-point of the eyebrows at the forehead, then below the eyes on both sides of the bridge of the nose. Take a mini-nap. Put your head back, close your eyes, and relax for 3 minutes. Insufficient sleep may weaken your vision, so shoot for 8 hours of sound sleep a night. Rest your eyes 10 minutes for every 50 minutes spent reading or in front of the computer. If your eyes feel overly tired, lie down and place cooling cucumber slices over your eyelids. Medication: Take homoeopathic medicine which will help you in preventing rather reducing the power of your eyes. Take Physostigma 6/ thrice daily for 1 month. Thereafter, revert back for further guidance. I have alway have a problem in my eyes after take bath it go to red upto 3 or 4 hour daily. Hello sir, sir m facing itching problem at sights of my legs. Its had 1 month approx and its increasing day by day . At the itching portion , that part is totally dry .i can see a white powder type dryness at that portion . I tried lucobat gm . Its gets me relief for a while but it's not a permanent solution . My 8 year daughter excess eye blinking due to some eye allergy and dry eyes she feel something in eye ,pain and tears please prescribe me some medicine for my 8 year daughter some multivitamin syrup for dry eyes. Hi Janvi... Multivitamin tablet will not help.. And my suggestion is to take proper treatment by Consulting.. Don't experiment when it is related to eyes.. Get proper check up and then take treatment.. Still if you want try taking Homoeopathic eye drops Euphrasia.. I am Having squint eyes, due to an accident my eyes went like squint. Is there any treatment to gain as normal eyes? If surgery made, is it be permanent? Else it'll become squint again? If you are having no vision in Squinting eye, it will again take same Squinting position in 5-10 years after squint surgery & if there is normal vision in Squinting it will remain straight through out life. Dear Doctor, My mother age was 48. She diagnosed thyroid. It is effecting on her eyes (Thyroid optholomopathy), Left eye was 22 inches. Came outside. TSH and T4 levels was abnormal. What is the permanent solution for this. Is there any treatment to cure it. Please help us. We are looking for your support. Thanking you. Hello there is no cure but in thyroid eye disease, we look if the disease is active or stable if active, then we give steroids if stable, then bulging of eyes can be treated with surgery. My daughter has cold and pain swallowing, slight fever. Frequent sneezing because of which eyes have also become weak. Please help. She may have tonsilitis and adenoids.. You may give her Homoeopathic Medicine Hepar Sulph 30 one dose see if it helps.. It is advisable to take proper treatment... You can consult me through lybrate.. Recently In my college eye test was conducted and my vision is 6/9.so what should I do to increase my vision without glasses. Is that possible that without glass I can have my vision 6/6. I have red eyes for more than 3 days. And I am unable to do my regular stuffs finely. It is really getting quite uncomfortable for me now. For red eyes we need to put anti allergic with anti inflammatory eye drops after personal consultation.